VIET NAM – During the timeframe from 1996 to 2006, Viet Nam’s pork production more than doubled (132 per cent). This illustrates rapid growth- not mainly with large scale farms, but through constant growth from small farms, specialized pig households and the large scale farms, write Ron Lane, Senior Consultant, and Meggie Vo, Research Assistant, at Genesus Viet Nam. In the early timeframe, increasing the pig numbers increased pork production, but in 2006 increased yields were solely responsible for the continuing increase in pork supplies. In recent years, the intensification of Viet Nam’s pig sector has shown rapid growth. The larger scale commercial farms are concentrated around the 2 largest markets — Ho Chi Minh (HCM) City and Hanoi. With rising incomes in Viet Nam and within both of these major cities, producers have seen the market for pork expand. With this, the demand by the consumer for better quality pork has increased. The large scale farms construct near and around the large cities and they in turn respond to the consumer demands. The cities have made the pork producers especially the large scale farms more market-oriented. With this, the farms want to improve pork production techniques, introduce new management and source better genetics for pig production. Large scale commercial feed mills are providing better nutrition for the farmers. All of these factors have added substantially to the total supply of quality pork in Viet Nam. Data in Table 91 (p.217) of the Results of the 2006 Rural, Agricultural and Fishing Census: Volume 3 – Agriculture, Forestry and Fishing, General Statistics Office, Hanoi, 2007, indicate that in 2006 more than half of Vietnamese households (55.72 per cent) had 2 pigs or less and that only 1.75 per cent had 21 pigs or more. In 2001, the corresponding percentages were 66.8 per cent and 0.3 per cent respectively. Also, data from the same report, indicate that there were only 10,811 registered pig farms in Viet Nam in 2006. Thus the small household farms and the specialized pig households still produce and market the majority of the pigs in Viet Nam. Ministry of Industry and Trade reports for this year, the country will produce 2.26 to 2.38 million tonnes of pork. The total consumption of pork is estimated to be between 2.4 and 2.5 million tonnes. The shortfall will be covered by pork meat imports in the range from 3 to 5 per cent. This will not significantly affect domestic supply. In the first six months of 2011, the livestock industry has faced many difficulties due to epidemics (such as FMD, Swine Influenza and PRRS) along with some natural disasters. According to statistics from various ministries, the preliminary evaluation on the production of livestock herds in the country has 26.3 million total pigs (down 3.71 per cent over the same period last year-27.3 million for 2010 and down from 27.6 million for 2009). Currently and compared to other countries, Viet Nam’s total pig production ranks 4th in the world, behind China, USA and Brazil. Viet Nam’s supply of pork rose from 14.8 kgs (32.6 lbs) per person in 1996 to 29.8 kgs(65.6 lbs) in 2006. This year, if one uses 2.5 million tons of pork consumed for 2011 divided by 87.2 million residents, then the total is calculated at 28.7 kgs (63.1 lbs) per person per year). From this, Viet Namese consume ample pork. Consumption for 2015 is projected to be about 43 kgs (94.6 lbs) per person per year; however, the past few years have seen the effects of disease and thus this projection will be difficult to realize. The Viet Namese National Government has in place plans to encourage and incentives to enhance pig production. Will they want to greatly increase imports of pork-doubtful? During the first part of 2011, most fresh foods have seen excessively high prices as compared to recent years. The price of pork is no exception. Pig prices have increased rapidly and recently had reached about 70,000 VND / kg ($ 3.36 US/kg.). Currently, in Ho Chi Minh (HCM) City and nearby provinces (southern Viet Nam), the slaughter houses have to pay a range from 60,000 VND / kg ($2.88 US/kg) to 64,000 VND / kg ($3.07US/kg). In the northern region (Ha Noi City and surrounding provinces) prices range from 67,000 VND / kg ($ 3.22US/kg) to 69,000 VND / kg ($3.31 US/kg). These are all live weight prices for around 100 kg (220 lbs.) market pigs. As pig prices increase, then consumers have to spend higher prices for special cuts For example, recent prices include: 135,000 to 140,000 VND per kg for bacon (with ribs) ($6.48US/kg to $6.72US/kg) and 100,000 VND per kg for hams ($4.80US/kg). These are unprecedented high prices in history. Normally, after Tet Festival (New Year) and during the summer heat wave, the consumption of fresh foods decreases and thus, the price of food also drops. However, this year, food prices, especially pork increased during the first 6 months (up from 26 to 60 per cent depending on type of cuts as compared to the end of last year (12/2010) and is currently at the highest price ever measured. The new high price of pork has been happening since April. The fluctuation in the price of pork has caused both the farmers and consumers concern. Pork price stabilization programs in HCM City have recently been twice adjusted; the first is on May 25th and again on June 30th. The June 30th had a total increase from 4,000 to 15,000 VND / kg ($0.19 US/kg to $ 0.72 US/kg) depending on the types of cuts. With many farming enterprises, the lower amount of pork produced this year was affected by multiple diseases (a problem stemming throughout 2010 and into the early months of 2011). Other production factors such as increased feed costs, increased vaccine costs (and instability in supplies-some farmers mentioned no supply of FMD vaccines during this past Spring), increased utilities cost and also high interest rates curbed production. High interest rates caused producers to be afraid to expand their production or to buy replacement animals to replenish their breeding stock and or weaner pigs. Although the price of pork in the domestic supply was rapidly rising, the Department of Animal Health, Ministry of Agriculture and Rural Development, in the first six months of 2011 still sold 2,584 tons of frozen pork exports to the markets of Hong Kong and Malaysia. In addition, during the period from January to March this year, traders also sold 19,235 pigs to the Chinese market. Significantly, the outbreak of diseases has directly affected the sow numbers. So far, the total pig herd has fallen by more than 6 per cent. 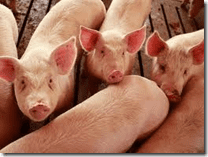 Replacement breeding stock and weaner pigs for feeding to market have become more expensive. Estimated average price of feeder pigs range from 1.2 million-1.5 million VND ($57.64 to $72.05 US/pig) for a small weaner pig upward to a range of 2 to 2.3 million VND ($ 96.06 to $110.47 US/pig) for larger feeder pigs. 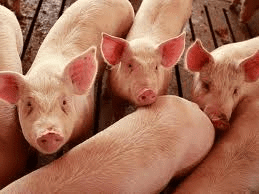 Higher cost of breeding stock plus feeder pigs coupled with higher feed costs and increased overall production inputs, has affected the optimism taken by the farmers. On top of this, interest rates on operating loans can range from 22 to 25 per cent per annum. Many of these farmers experienced the huge financial losses due to the disease epidemic and are reluctant to start right now. Even though, all of these factors are included, actually with the current meat prices, farmers can profit from 15-25,000 VND / kg ($0.72 US/kg to $1.20US/kg). Rising world prices of raw materials including the price of US corn (compared to May 01/2011, rates have increased from 61 to 62 USD / ton for US corn). Exchange rate USD / VND has an increased impact on production costs of enterprises by the feed manufacturer in the country heavily dependent on imported raw materials. The cost of input factors such as adjustment of fuel prices, electricity, water, and other related feed production costs. Some other issues affecting the supply of raw materials such as contaminated goods or export tax increase, such as one delivered by India with an increase on bran. According to the Feed Association, Viet Nam annually imports 55-60 per cent of the necessary total feed inputs. In 2010, the Country, imported nearly 7.8 million tons, worth approximately USD $ 2.7 billion. For the expected total in 2011, Viet Nam will have to import 8.5 to 9 million tons of ingredients with prices closer to $ 3.2 to $ 3.4 billion USD. (The breakdown includes the import from 20 to 25 per cent energy-rich feed material, 65 to 70 per cent of the total protein and 85 to 90 per cent additional ingredients of animal feed production—vitamins, enzymes, lysine and other products). Most of the raw material prices have vastly increase over last year: including corn reached 7,897 VND / kg ($ 0.379 US/kg), up 23.7 per cent; cassava to 6,069 VND / kg ($ 0.291 US/kg), up 18.1 per cent; Lysine 51,750 VND / kg ($ 2.486 US/kg. ), up 8.3 per cent, rice bran 6,150 VND / kg ($ 2.95 US/kg), up 6.3 per cent. Other materials showed some decline: soybean meal 10,477 VND/kg ($ 0.503US/kg), down 5.9 per cent; fish meal 22,218 VND/kg ($ 1.067US/kg), down 9 per cent and methionine 110,147 VND/kg ($ 5.29US/kg), down 5.8 per cent. There are 241 feed mills in Viet Nam.